Mortal Kombat X and "casual versus core"
Back in the day, fighting games sold systems and divided players. When I was a kid you played Street Fighter or Mortal Kombat, and it was the Mortal Kombat kids that had all the cool stories about fatalities to tell in the playground. 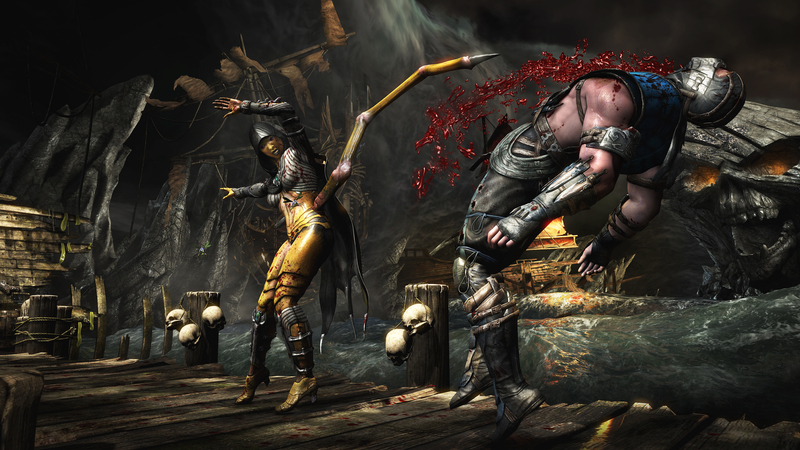 Now it's the shooters that sell systems and fighting games are the cult titles, played by gamers who have never even stepped into an arcade, but that hasn't dimmed Warner Bros. commitment to creating a AAA experience with Mortal Kombat X. GamesIndustry.biz spoke to marketing games manager Brian Goodman about how you sell fatalities in 2015. "We want to bring more people into our game and we're doing that by giving them a great fighting game and then adding a ton of content to that," he says as someone's spine is ripped out on the screen just behind him. "We've implemented a lot more single player content. Story mode has been a huge mode for us in attracting more people into the genre, attracting more people to our game in general." "The casual is looking for ways to enjoy this game that don't depend on you being the greatest fighting game player in the world"
The content he's talking about is a network of connected experiences and solo player challenges that help to beef up the simple one-on-one combat that is the very essence of fighting games. So Mortal Kombat X offers factions - choose one and all your activity helps propel that faction to victory (or condemn it to shameful failure) - and the Living Towers, an updated version of the challenge towers from past titles that will be updated regularly. "With the resurgence of fighting games we're seeing a lot more people coming into the genre and for Mortal Kombat X specifically our hope is that they're seeing that - whereas the fighting is the centrepiece - the game is about more than that." But who is playing fighting games these days? Is it the old school fighting game fans with their specifically selected arcade sticks or a new generation lured in by the competition and gore? "I don't know if it's so much old and new as it is casual versus core. The casual is looking for ways to enjoy this game that don't depend on you being the greatest fighting game player in the world. Fighting games, more so than some of the other genres, it's very skillcentric. You either have the skills or you don't," says Goodman. "And so for us to allow for different types of gameplay so people who aren't going to win every online match they enter can still enjoy this game, I think think that's really where we set ourselves apart. As far as fighting games go I think we compete with any game on the market as far as the depth and technical expertise you need to be great at this game. So we really wanted to make sure we're differentiating in the sense that we can bring a lot more people into the game and widen the scope of what it means to be in this genre." "We see all major games as our competition, we are battling to be part of the conversation of hit games"
The developer NetherRealm Studios has already attracted a Twitch following, over a million views, with Mortal Kombat X matches. Goodman says the new culture of sharing and eSports is something the team has been thinking about, and it's expecting to be a hit on streaming sites. After all, says Goodman, it's a "great spectator game." As if on cue my competitor burrows through my sternum on screen. "Our goal is to make the most entertaining presentation as possible, that's our goal in creating fatalities. Obviously it's a part of the game, it's something that we're sort of known for, and that gives us a great opportunity," he says. The series has had trouble in the past with ratings boards, namely in Australia and Germany. "It's not something we do for the sake of doing, it's something that we want to put as much creativity into as possible and just come up with the most entertaining thing that makes sense for the game." The game is due for release in April and its hard to see what its competition currently is in the console fighting market. Dead Or Alive 5? UFC? Its old nemesis Street Fighter V? Amazon is the only place to mention a release date as yet as that's set for 2016. "We see all major games as our competition, we are battling to be part of the conversation of hit games. We are very near and dear to the fighting game genre but when we talk about the landscape of games we're up there with any of the big games that are out there."